Unexpected Homeschool: Our Artsy, Science-y, Fun, Learning Week. Our Artsy, Science-y, Fun, Learning Week. The third full week of school has finished and we are finally, almost, maybe finding a rhythm. We are still struggling with waking up on time when there isn't a pressing appointment outside of the house. So our goal for next week is to wake up on time Tues-Friday (because Monday is a holiday for us). We were fairly productive this week and I am more confident about the amount of subjects we have scheduled for this year. I was afraid there might be too much, but it appears for now that all is going well and we have just the right amount of lessons each day. Flubber bubble blowing. A sensory anxiety release tactic Amber learned in therapy. It seems to work too! We've officially finished our study of the Civil War and will be moving on to Reconstruction next week. While it was Amber's first time studying the Civil War and so learned a great deal during this unit, I also learned things that I didn't know before. I hope the remainder of history this year is just as interesting for Amber. Mrs. Frisby and the Rats of Nimh became the next book in our Literature study during our weekly book discussion time. This was one of my favorite books in grade school and thankfully Amber is also enjoying it. She already at our first discussion point and impatiently waiting to read farther. Amber can't ever stand to be without a book to read and currently has read all of her books in the house, so the impromptu library stop earlier this week was a welcome addition to our errands for the day. She likes to read the Royal Diaries series of books. They are quick little reads for her, usually under and hour, but she is intrigued by them. The last one she read was on Elizabeth I of England. This week she found Catherine the Great of Russia and Eleanor of Aquitaine. Turtle making his way to the rose garden. 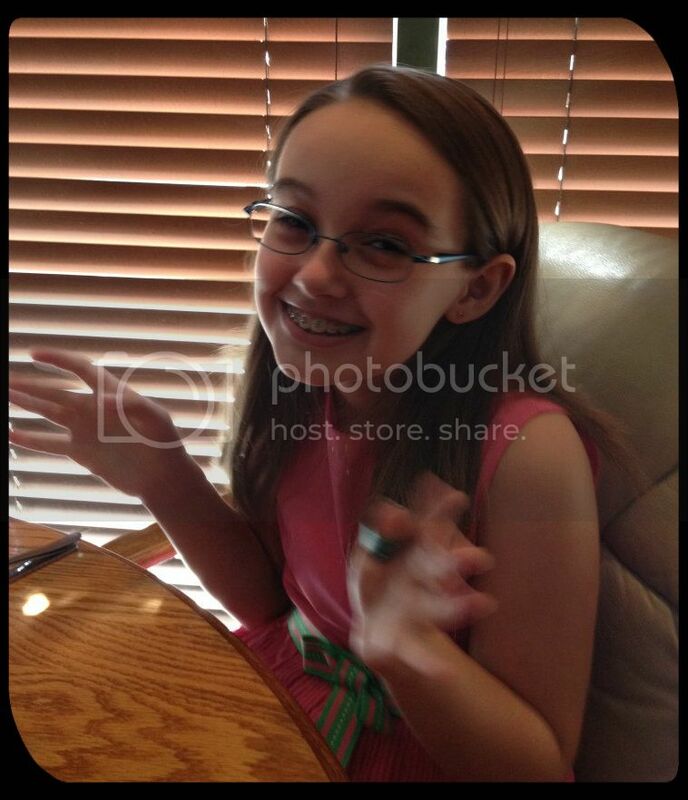 Amber imitating the turtle. We had a bit of excitement on lawn mowing day this week as well. Right before I started on the yard, Amber spied a turtle walking across our back patio. We have never seen a turtle in our yard at either house we've owned since she was born. Amber guarded it carefully, until it was safe in the landscaping and munching on my rose bushes. She really enjoyed watching the turtle and talked about it the rest of the week. I think we may need to implement a nature walk into our schedule, or at least investigate our own yard a little more often. 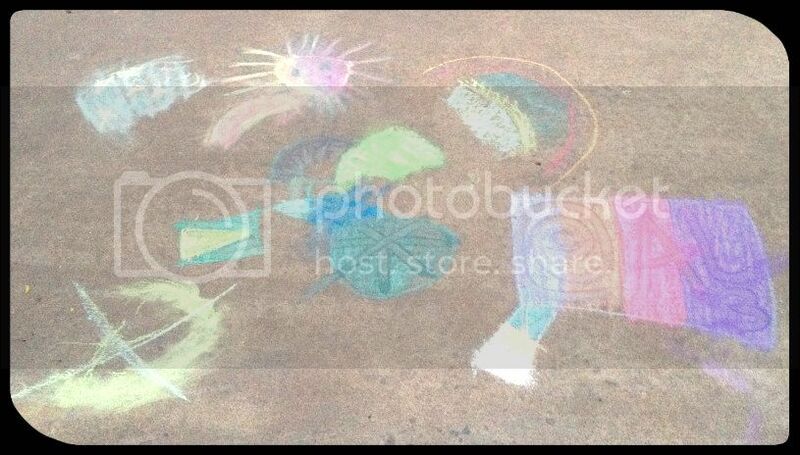 While I mowed Tuesday evening Amber decided to do a bit of chalk drawing on the driveway. She is not fond of drawing on paper and always mentions her poor drawing skills. However, if you give her chalk and an empty driveway she will draw and color for hours. Something about the nature of driveway drawing makes her feel more secure in her abilities or less pressured by expectations. Whatever the reason, I'm thrilled she still has fun producing driveway art for us. In science this week we continued the study of earthquakes and volcanoes. Amber read a couple of encyclopedia for children books on the science topics that she found at the library too. These were entirely her idea and not even the reason for our trip to the library. She learned a lot more from those books than from her text book. Our science lab for this week was the much anticipated exploding volcano. I was lazy and not entirely enthusiastic about the detailed instructions in our science curriculum, so instead I bought the volcano kit from Michael's and it went much smoother than building the volcano from scratch. The first day we put together the framework for the volcano and layered the plaster strips on the base. After it had dried, on the second day, Amber painted the volcano to her liking. She had ideas in her head of where side vents needed to be located and the amount of lava flowing from those vents as well. We did wait for the paint to dry, and Daddy to return home from work, before exploding the volcano. Amber was a little afraid it was going to be a huge eruption, so in the end we decided to have a Hawaiian style "runny nose" eruption. This suited Amber perfectly fine and she loved every second of the lab. (Top, L-R) Designing volcano on paper;Painted volcano; Adding lava flows to paint. 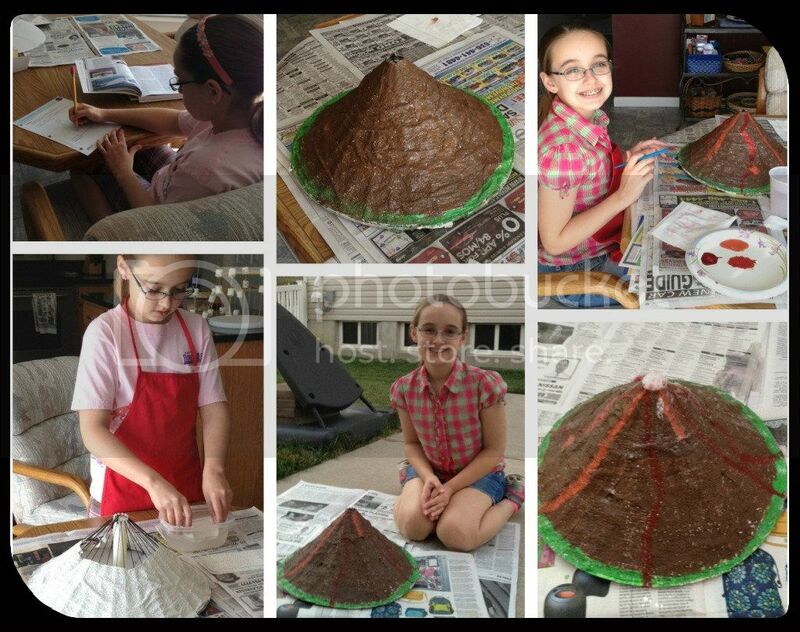 (Bottom, L-R) Making volcano with plaster strips; Finished volcano ready to go; Beginning of eruption. Last week on Friday afternoon we did attempt our art appreciation study and first creative writing lesson. Art appreciation went quite poorly and we have since decided to find a different curriculum. There are lots of good ideas in the curriculum we were using, it is just very dry and doesn't get to the appreciation part very quickly. Amber lost interest fast. We will try art appreciation again next week, after I have the new curriculum ready. Creative writing, however, went splendidly. Amber happily talked through the first lesson in the preparation for writing her novel and even completed the exercises without any complaint. We are going to try to sneak in another creative writing lesson during the long holiday weekend. Today, Friday, was too busy to do much in the way of school. Today, we were caught up in school so had the whole day for fun time out with my mom. As Amber has gotten older my parents preferred to celebrate Amber's half-birthday in July instead of a big celebration on her actual birthday in January. My dad felt her birthday was so soon after Christmas that she was missing out on truly enjoying her birthday. This year my dad was in the hospital on her half-birthday and died soon afterwards. Mom wanted to continue the tradition, even though it was a little late. So, today we spent the day out shopping and eating with my mom. It rained the entire time, but we had great fun anyway and laughed the whole day. I love that you, Amber, and your mom could celebrate together....what a sweet tradition. Love the volcano - it looks fabulous! It looks like a great week. I love the volcano, and also that you managed to uphold a birthday tradition and laugh despite your collective grief. Good for you all. So many good things here Christy! We started History after the Civil War so we just finished Reconstruction. We BOTH learned so much! I never knew what a huge deal it was afterwards. They called it the "2nd Civil War". We try to do Nature walks as often as we can too. In fact we were just talking about the fact that we need to do more. We are ALWAYS outside but not necessarily 'walking and exploring'. Love the chalk art. Keilee doesn't think she can draw either but she loves doing it. Mainly 'Fashion' sort of things. Have you checked out Harmony Art Mom's art appreciation studies? They are really great. Also we celebrate Kei's half birthday in July! Her birthday is Jan. 3rd. :) Happy Labor Day weekend! We are going to try Harmony Art Mom's art and music appreciation. We may even try this weekend, just to get going. I'll see. Hope you are having a good weekend too. I will have to check into those Royal Diaries for my girls. Thanks for sharing. Thanks for sharing. I can completely relate to you on some many things that you mentioned which is fun and refreshing for me. I especially relate to the waking up on time! We are having great difficulity with that this year. I also relate to wondering if I have too many subjects planned for the year. My kids are working through their daily plans nicely so I too have decided that it's ok but I did wonder the first few weeks. I love the 1/2 birthday tradition. Both of my kids have early January birthdays so I should really consider this as a new tradition for them next year. They are 5 days apart (+ 5 years) but we could do a 1/2 birthday together!! Thanks for the mention of the Royal Diaries. My daughter loves to read and I am always looking for something new. I look forward to reading your updates on HMJ in the future.